Android is taking the smart phone market by storm. The graph above shows the latest data from Nielsen - pretty self explanatory. Android (green line in graph) market share up to 27% , actually overtaking Iphone for the first time too. 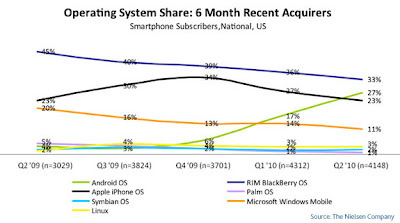 RIM Blackberry and Windows Mobile are sinking fast. What's amazing is how fast Androids market share is growing. Very promising for Android, but the actual graph is misleading. This is the purchases done within the last 6 months and does not indicate the real market share, in which my assumption is that iPhone is still leading on Android. I understand such data is hard to obtain since someone might have both an iPhone and an Android and be keeping one in the cupboard, and going by web browser data would follow an assumption that Android and iPhone users browse the net equally. Well it depends how you define market share. I think its correct to decide based on sales in last 6 months rather then installed base. Also installed base for mobile phones is hard to measure because mobile phones get used on average 1-2 year so its difficult to know which are still in use or not.